The French team produced a remarkably consistent performance on their Diam 24 trimaran during the two-week marathon along Oman’s coastline, gradually building and extending a lead over nine other international teams across five venues and a mix of inshore Stadium races and long coastal Raids. Overall, they finished seven points clear of their nearest challenger, and also won the standalone Stadium Racing trophy. 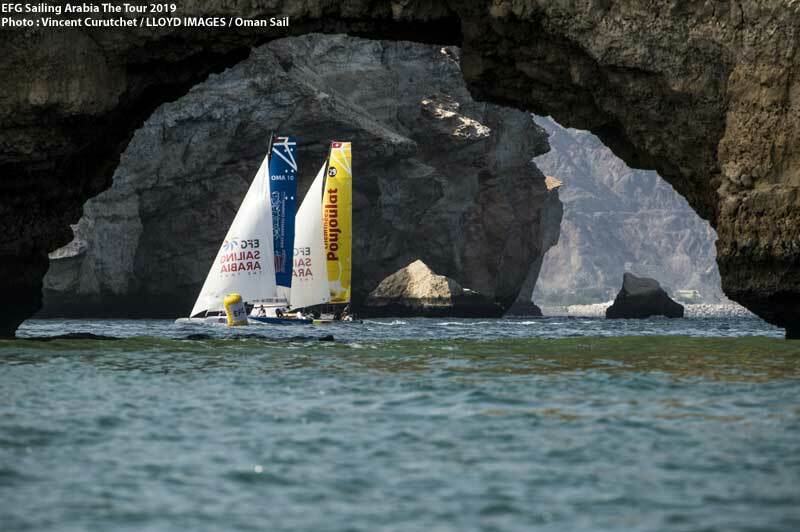 Coached by Pierre Mas and helmed by Valentin Bellet the Beijaflore crew held off a determined challenge by the Cheminées Poujoulat team, who had taken an early lead in the Tour after a strong performance at the first venue in Muscat. “It’s great to win here in Salalah for the second year,” said Bellet. “The whole team is delighted with this victory and we hope to be able to come back next year. For Cheminées Poujoulat the runner-up spot marks a significant improvement on their fifth place finish on last year’s Sailing Arabia adventure. 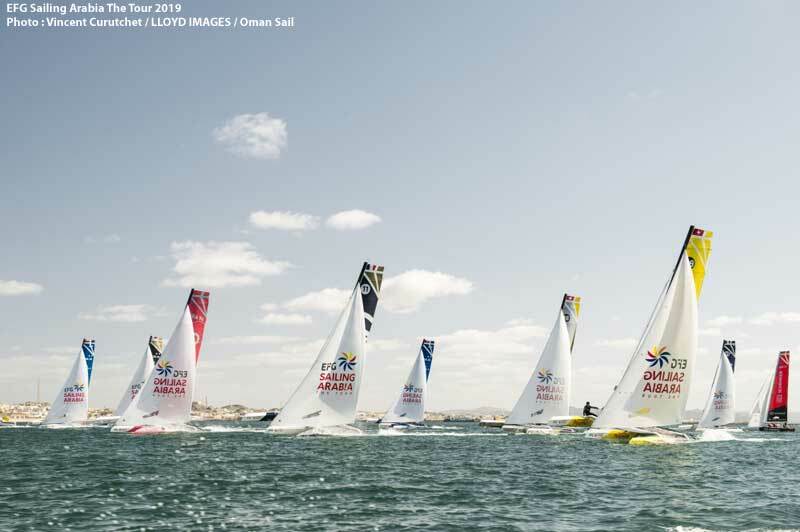 Helmed by Robin Follin, and managed by another sailing legend, Switzerland’s Bernard Stamm, the French team further demonstrated their form when they won the final day of Stadium racing in Salalah. 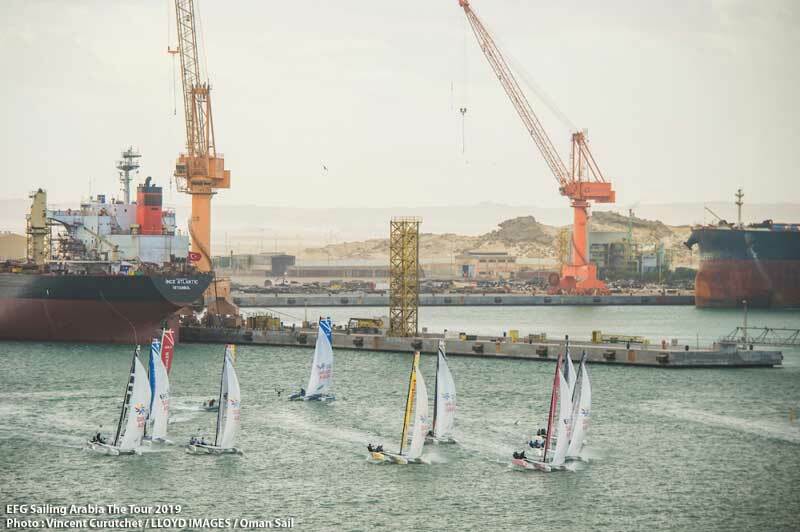 The final place on the Tour podium was taken by the international crew aboard the Oman Shipping Company entry, with British Olympian Stevie Morrison teamed with French tactician Quentin Ponroy and Oman Sail instructor Raad Al Hadi. They hung on in a final day nail-biter which saw them take third place by just half a point from the young crew on Seaflotech. said Morrison reflecting on an uncharacteristic eighth place finish in the five-race Stadium-style finale. The Salalah prize-giving saw the three podium teams applauded by all the crews and VIP guests during a ceremony attended by guest of honour His Excellency Sheikh Salim bin Aufait Al Shanfari, Chairman of the Dhofar Municipality. David Graham, CEO of event organisers Oman Sail, thanked event sponsor EFG Bank, boat sponsors and the event partners and supporters who made it all possible. “It goes without saying that we look forward to the opportunity to welcome you all back next year,” he said. In the mid-fleet rankings the Swiss team on Mood finished the Tour on a high, with two race wins on the final day on their way to fifth place overall, as did the all-woman crew on DB Schenker who finished third in one race, their best result of Sailing Arabia. EFG Bank, meanwhile, overtook Golfe du Morbihan on the final day to claim sixth spot. Skipper Franck Cammas said : “All the teams here were great competitors, and we have seen a really high level of racing in the Diam 24. Overall, the CER Geneva team took eighth place, and can reflect on their winning day back at the Masirah venue, to finish ahead of Renaissance and DB Schenker.